Behavioural economics, psychology and persuasive technology have proven to be very popular topics over the past decade. These subjects all have one aspect in common; they help us understand how people make decisions in their daily lives, and how those decisions are shaped by people’s prior experiences and their environment. A question then arises around what it means to change people’s behaviours and how one can design to achieve such change. Understand – The process starts off with gaining an understanding of how people make decisions and how our cognitive mechanisms can support (or hinder) behavior change. Discover – The second stage is about a company working out what it wants to accomplish with the product, and for whom. Design – The actual design stage can be broken down into two subtasks: (1) designing the overall concept for the product and (2) designing the specific user interface. Refine – Analyzing data to generate insights and ideas for ongoing improvement of the product. The Understand stage is all about understanding how people make decisions and how the mind decides what to do next. There is a clear distinction between the deliberative and the intuitive mind. Our deliberative or “conscious” mind tends tends to be slow, focused and self-aware. In contrast, when people are in an intuitive or “emotional” mode they are likely to act on “gut feeling”, fast and unaware. Most of the time, we are not consciously deciding what to do next. Instead, we often act based on habits. Even when we do think consciously about what to do next, we actively try to avoid hard work. Cue – A cue for users to think about what to do can either be internal or external. External cues happen when there is something in our environment triggering us to think about a certain action. Internal cues are the result of our minds thinking about the action on its own, through some unknown web of associated ideas. Reaction – Once the mind has been cued to think about a potential action, there is an automatic reaction in response. This reaction tends to be intuitive and automatic. Ability – Assuming the choice has been made to act, the question arises whether it is actually feasible to undertake the action. Wendel suggests that the individual must be able to act immediately and without obstacles. Timing – When should you take the action? The decision when to take action can be taken based on a sense of urgency, and by other, less forceful factors. Evaluation – After an initial intuitive response, there might be room for a more conscious evaluation of the action and of potential alternatives. This happens especially when we are facing novel situations, and we do not have an automatic behavior to trigger. 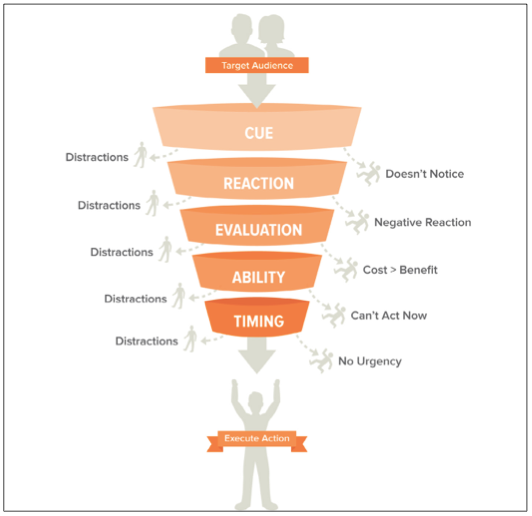 These five mental events can be best summarized through the “Create Action Funnel” (see Fig. 2 below). The main point to make with respect to this funnel, is that people can drop out out at each stage. A person will most probably only continue through the funnel if the action is more effective or better than the alternatives. Cheat – If what you really care about is the action getting done, and it is possible to all but eliminate the work required of the user beyond giving consent, then do it. Make or change habits – If the user needs to take an action multiple times, and you can identify a clear cue, routine, and reward, then use the “habits” strategy (see Fig. 3 below). Support conscious action – If neither of the two aforementioned strategies is available, then you must help the user consciously undertake the target action. Clarify the overall behavioral vision of the product. Identify the user outcomes sought. Generate a list of possible actions. Get to know your users and what is feasible and interesting for them. Evaluate the list of possible actions and select the best one. Which type? – Does the product ultimately seek to change something about the environment or about people? Where? – What is the geographic scope of the impact? What? – What is the actual change to the environment or person? When? – At what point should the product have an impact? Within the Discover process, a lot of emphasis is placed on finding the “Minimum Viable Action.” This is the shortest, simplest version of the target action that users must take so that you can test whether your product idea (and its assumed impact on behavior) works. At the end of the Discover stage, you should have detailed observations about your users, a set of user personas, and a clear statement of the target outcome, actor and action. Structure the action – To ensure that an action is feasible and inviting for the user. Creating a “behavioral plan” can be a good way to outline the different steps users should take from what they are doing now to using the product and completing the target action. This can be a simple flowchart or a written narrative; the key objective here is to think about the sequence of real world steps a user needs to take to complete an action. Design the environment – To ensure that the environment is constructed in such a way that it supports the action. When talking about “environment,” Wendel means two things. Firstly, the product itself. For example, a web page or smartphone where a user takes an action. Secondly, the user’s local environment, which can be both physical and social. Wendel then goes on to identify a number of ways in which products can construct an environment, e.g. by increasing the motivation for people to act or by generating a feedback loop. Prepare the user – How does one prepare the user to take action? Stephen Wendel suggests three tactics which can help to prepare the user to take action, now or in the future: “narrate” (change how users see themselves), “associate” (change how users see the action) and “educate” (change how users see the world). Impact Assessment – Measure the impact of the product, based on clear target outcomes and well defined metrics for each outcome. Here it is important to set clear thresholds for success and failure. Identifying obstacles to behavior change – Discover problems, develop potential solutions and generate additional ideas for how to make the product better. One can start this process by watching real people using the product (direct observation) and by gathering usage data. We can thus start getting a better insight into how people use the product, what the bottlenecks are, where the product is having the most impact on people, etc. Learning and refining the product – Determine what changes to implement through (1) gathering lessons learned and potential product improvements (2) prioritizing potential improvements based on business considerations and behavioral impact and (3) integrating potential improvements into the appropriate part of the product development process. 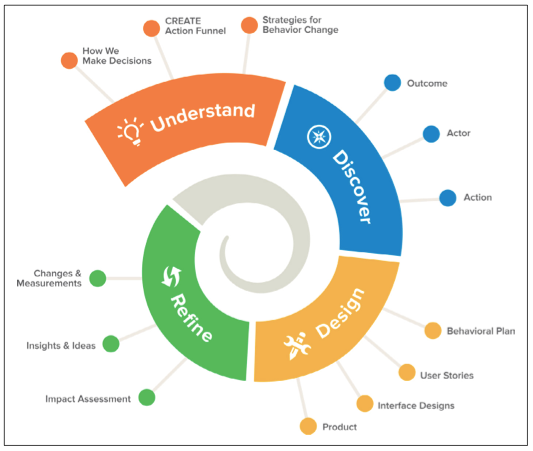 “Designing for Behavior Change” offers good insight into how to best design in order to impact human behavior. Not the easiest of topics, Stephen Wendel provides a clear framework against which we can think about the behavior a product needs to impact and how to best achieve this impact.